New York City has operated the Staten Island Ferry since 1905. 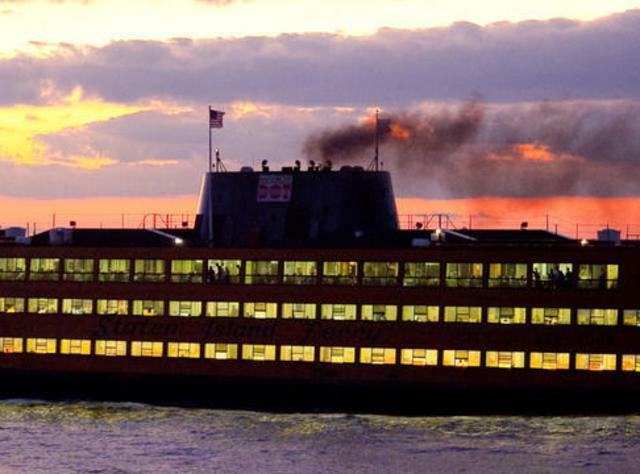 The Ferry carries over 22 million passengers annually on a 5.2-mile run between the St. George Terminal in Staten Island and the Whitehall Terminal in Lower Manhattan. The Ferry runs 24 hours a day, 365 days a year and is considered to be the most reliable form of mass transit, with an on-time performance of over 96 percent. During rush hours, the ferry runs on a four-boat schedule, with 15 minutes between departures. NY Waterway is a private transportation company running ferry and bus service in the Port of New York and New Jersey and in the Hudson Valley. NY Waterway uses ferry slips at four terminals in Manhattan as well as terminals and slips in Jersey City, Hoboken, Weehawken, and Edgewater, all located along the Hudson River Waterfront Walkway, and at landings on the East River in Brooklyn and Long Island City. Commuter peak service is also provided on the Haverstraw–Ossining Ferry, Newburgh–Beacon Ferry, and to the Raritan Bayshore. Excursions and sightseeing trips include those to Yankee Stadium, Gateway National Recreation Area, and Governors Island. Seastreak operates fast passenger ferry services in the New York metropolitan area. The company offers high-speed catamaran services to points in Manhattan from Central New Jersey with a fleet of five vessels, four with capacities of up to 500 passengers and one with capacity of up to 149 passengers. In addition to commuter service, Seastreak offers an array of special events and sightseeing cruises year round. With its iconic 12-vessel fleet of black and yellow-checkered vessels, New York Water Taxi has been a New York fixture since 2002. The company’s fleet also includes the boats of its sister organization Circle Line Downtown. New York Water Taxis provide exciting ways to see New York City’s dazzling skyline, celebrated bridges, and lush waterfront parks. Statue Cruises is the official ferry provider for the Statue of Liberty, Liberty Island, and Ellis Island. The company offers departures throughout the day from both New York and New Jersey for the convenience of out-of-town visitors and local residents alike. Passengers can also purchase Statue of Liberty tickets at departure points. Also operated by Statue Cruises, the Liberty Landing Ferry is a fast, affordable, efficient alternative for working professionals. For more information, visit LibertyLandingFerry.com. Upstate, Lake Champlain Transportation Company has provided reliable, safe and friendly transportation to the surrounding lake community and to area visitors since 1826. The company crosses the lake three times a day, 365 days a year. Check out the crossing schedules for departures --- no reservations necessary!